During the month of May, enthusiastic hikers across Alaska are making plans for summer adventures. Blockbuster destinations such as Denali National Park, Denali State Park, Chugach State Park, and well-known trails such as Resurrection Pass and Chilkoot Trail top many lists. For those looking for a less crowded experience, bring your daypack and car camping gear to Thompson Pass for premier alpine trekking. 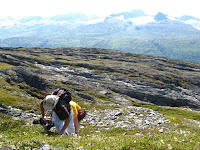 Thompson Pass is a high altitude (2,678’) pass located in the eastern Chugach range. Alaska Highway 4, more commonly known as the Richardson Highway, crosses the pass at milepost 26. The summit area offers the best access for hiking. Snow melts earliest off the ridge that runs west from the summit pull off. This ridge top and the south facing slopes that roll off it provide fine spring and summer walking. Don your boots and head up the dirt road that follows the ridgeline. Graywacke slabs dotted with crusty black lichen, bearberry, low-bush cranberry and blueberry line the road. Very little brush exists at these elevations, which means that the awe-inspiring mountain scenery is never obscured. When the road peters out, continue walking the bench to the point where the it terminates, dropping into Sheep Creek canyon. Along the relatively level way, you’ll pass by two beautiful clear alpine lakes which, in May and June, will contain as much snow as water. You’ll cross several streams fed by melting snow. By June, the season’s first flowers can be enjoyed: windflower, marsh marigold. As the summer progresses, the tundra turns into a carpet of minuscule floral arrangements that will draw you to your knees for closer examination. Take the time to wonder at the fascinating variations. 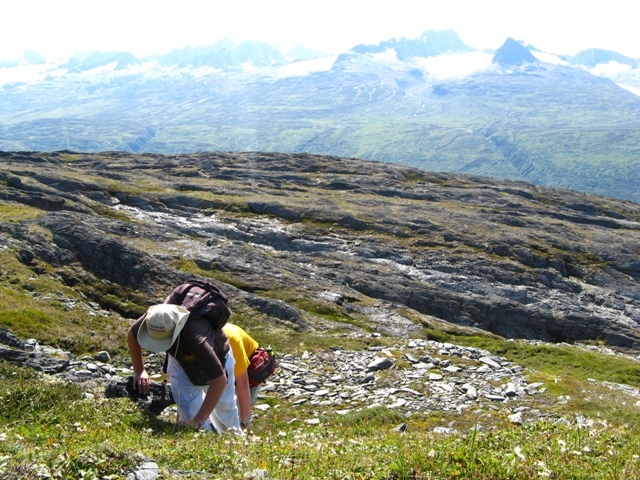 Chirping arctic ground squirrels and whistling hoary marmots will entertain you on this walk. For a stronger climb, wait until June when the winter’s snow has melted back enough to expose routes to the top of Little Odyssey on the east side of the highway. Park at either the summit pull-off or the other paved pull-off at approximately mile 26.2 and then hike from there. Pick your own path, staying on the tops of the benches and ridges that lead to the summit. You’ll stay drier by staying higher. Drainages capture and hold water and later in the summer become havens for water-loving plants such as saxifrage, cotton grass, valerian and shooting star. Both hikes afford 360-degree views of stunning peaks, glaciers, and the braided Lowe River valley below. Blueberry Lake State Park offers 25 campsites and pit toilets for $12/night. Grab the campsite at the farthest west end of the main loop for the best views. 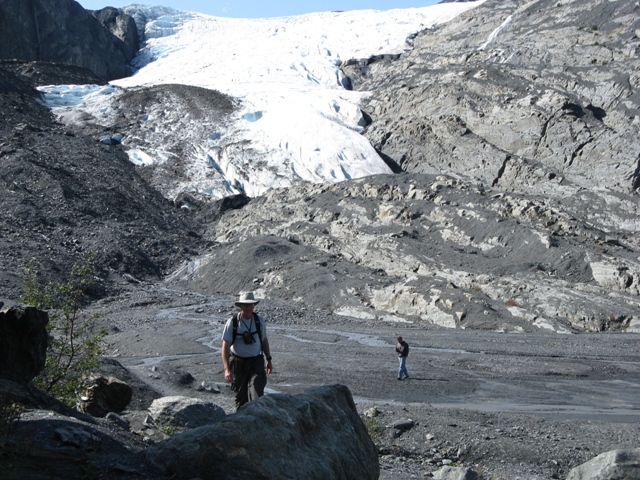 A short paved path at Worthington Glacier State Park provides access to the lake shore. From there, it is possible to make your own way around the lake and hike along the moraines and recently exposed rock. An unmaintained user-worn path exists atop the southern moraine of the glacier. In places, this route is strenuous and features several steep drop-offs, but the views of the glacier and surrounding peaks are spectacular. From the Blueberry Campground entrance, it is possible to access the soft benches above the highway and hike east towards Marshall Pass under the summits of Odyssey and Good Wills. Wait until the snow has completely retreated so that the ground will be dry and the creeks crossable. This hike requires some bushwhacking from the highway to get above brush line and onto the tundra. Thompson Pass is a coastal mountain pass and thus is subject to rain, dense fog, and snow flurries. Check the weather forecasts before heading out and always bring raingear, hat, and gloves even on day hikes. Try out a new piece of exercise equipment to keep it fresh - a stability ball, mini resistance bands? Lives in Valdez, Alaska and writes about whole foods, exercise, fitness, the outdoors, and destinations for active travel.